Victorians can enjoy a wealth of made-in-Canada works being staged locally this fall. AS I LOOK OVER THE LIST of productions opening this fall in Victoria, I feel heartened by the high number of both Canadian and local plays and operas. This is something to celebrate. In years past, the majority of plays produced in town would have more likely been American or British in origin. We now have a well-developed national theatre culture, and that means our regional theatre, the Belfry, can more easily program a whole season of Canadian fare. That is as it should be for a professional company receiving a lot of governmental support. But I am cheered to see that our local community theatre, Langham Court, is also presenting two Canadian plays this fall. The Phoenix Theatre at the University of Victoria is inviting back two alumni to present their plays about historical figures from BC history. And Pacific Opera Victoria will be presenting two new Canadian productions in November at their second performance space, the Baumann Centre. Opening September 12 is a play by Hannah Moscovitch, directed by her frequent collaborator and life partner Christian Barry. Raised in Ottawa, Moscovitch is a national and international award-winning playwright with a fiery intelligence and a cutthroat wit. Her plays are always intriguing, at times provoking, and often give actors big challenges due to the psychological depths she plumbs. The Children’s Republic tells the story of survival and hope in the Warsaw Ghetto during World War II. A number of Moscovitch plays have appeared at the Belfry as Spark Festival touring productions, including What a Young Wife Ought to Know earlier this year, along with Little One and The Russian Play in past Spark Fests. I am also eager to see the Belfry’s production of the musical Onegin, based on the verse novel by Alexander Pushkin. Its premiere made a huge splash at Vancouver’s Arts Club Theatre and it has gone on to be produced at the National Arts Centre. Created and directed by former Victorian and Phoenix alumni Amiel Gladstone (one of the founders of Theatre SKAM) and musician Veda Hille, the October and November production will also bring back to town Phoenix alumni and prominent Canadian theatre actor and director Meg Roe, alongside her partner Alessandro Juliani. This one will sell out, so don’t delay in booking tickets soon. Over at Langham Court Theatre, the fall season begins with Vancouver playwright and director Morris Panych’s The Girl in the Goldfish Bowl, directed by Janet Munsil. Winner of the 2003 Governor General’s Award, this touching comedy traces the journey of Iris, a young girl whose goldfish comes to life as a human just as her mother is planning to leave the family. Next at Langham is a Canadian classic (and one of my favorite Canadian plays of all time), Michel Tremblay’s 1969 comic masterpiece Les Belles Soeurs, directed by Judy Treloar. This all-women play shows us the lives of working-class French-Canadian Catholic women, oppressed by their husbands, poverty and too many children. These harsh realities are countered by the gathering of sisters and friends in Germaine’s kitchen. They are there to help her paste one million stamps she has won into booklets in order to claim her prizes. But her family and neighbours’ jealousy of her good fortune leads to betrayal, theft and total chaos. In October, the Phoenix Theatre is presenting WEST: A Tribute to BC Trailblazers, a double bill of short, one-person works by alumna and native Victorian Danette Boucher. 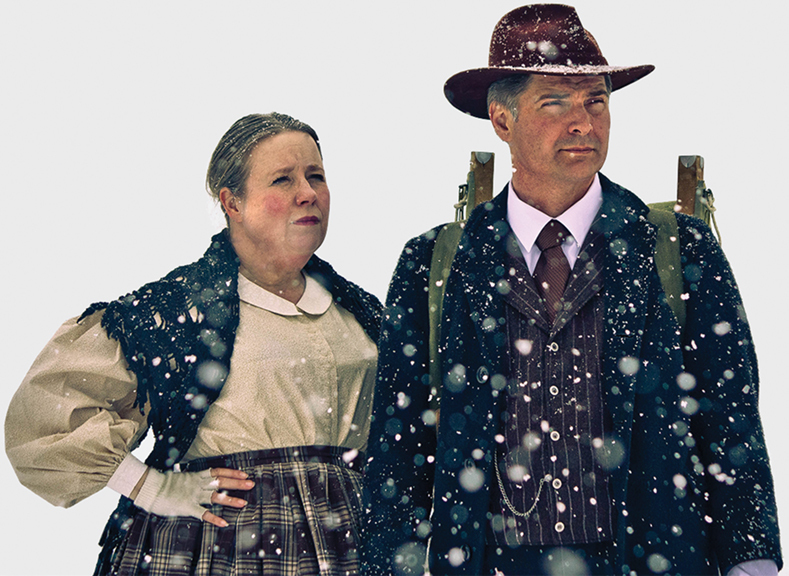 After graduating from UVic, she moved to Barkerville, BC, creating historically-based pieces like Lady Overlander, the tale of BC pioneer Catherine O’Hare Schubert (1835-1918), the sole female member of a group of gold prospectors who travelled together from Winnipeg to Kamloops in the spring of 1862. The Schubert family made the arduous journey over the Rockies with three young children in tow while the tenacious Catherine (played by Boucher) was pregnant with her fourth. She gave birth en route, with the support of indigenous women, in a village on the Thompson River. The Fred Wells Show will be performed by Boucher’s fellow Phoenix alumnus and husband James Douglas. Fred Wells (1861-1956) was a Depression-era American entrepreneur who believed that a second gold rush was possible in the Cariboo. With the support of investors, he prospected and found a gold seam. The miners who flocked to the area developed the town of Wells, BC, which bears the name of its founder. November brings two new and locally-composed operas, premiering at Pacific Opera Victoria’s Baumann Centre on Balmoral at Quadra. The first is Rattenbury by well-known local composer and sound designer Tobin Stokes. Architect Francis Rattenbury (1867-1935), who designed both the Legislative Buildings and the Empress Hotel, was murdered by his second wife’s teenage lover (their chauffeur! ), and the subsequent trial was a cause célèbre in the 1930s. The second new opera, Missing, is composed by Brian Current, with a libretto by indigenous playwright Marie Clement. Addressing the absences and deaths of so many indigenous women in Vancouver and on the Highway of Tears, Missing is a timely artistic statement on a national tragedy. During Canada’s 150th birthday year—as contentious as that event may be for communities who have lived on this land for much longer—our local theatre and opera companies are offering a broad and exciting range of homegrown and national fare. Monica Pendergast teaches drama and theatre education at the University of Victoria. Her new research project intends to survey key Canadian Theatre for Young Audiences companies which do high-quality artistic works for children and youth.